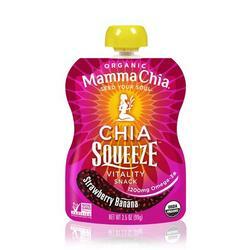 Perfectly paired Strawberries and Bananas are combined with fresh Beets to make this Chia Squeeze simply irresistible! Seed Your Soul¬ with this delectable vitality snack wherever your daily journey takes you! And perfect for every soulÍs lunchbox! Our organic chia seeds are infused with delicious fruits and vegetables to create a convenient, fun and tasty snack for active people of all ages. Fueled with essential Omega-3s, protein, and fiber, Chia Squeeze is a satisfying anytime snack that naturally provides the vitality to power your soulÍs purpose.